In a market that is chock-a-block with enhanced gemstones, Gemstoneuniverse brings to you nothing but the best where gems are handpicked and only those that make the cut into the jyotish quality bracket are offered for planetary gem therapy. Presenting the new lot of natural and treatment free jyotish quality Hessonite garnet from Sri Lanka. 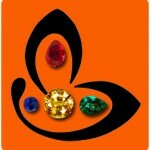 The new lot Flames 2012 is a fine collection of natural and unenhanced hessonite gems. Hessonite garnet or gomedh/ gomedhaka is the gemstone of planet Rahu, also known as the North node of the Moon. It also goes by the name of cinnamon stone. 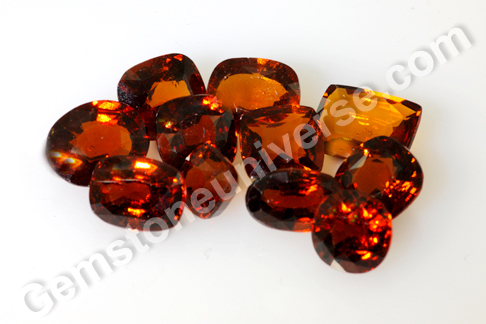 The hessonite used for planetary gem therapy should have deep burnt cinnamon orange color for best results. The hessonites in the new lot stand apart as they have great lustre and clear fiery embers that give a clue about the phenomenal planetary energy pulsating within each gem. In Planetary gem therapy, the gemstone of Rahu is very important as not only does it pacify the planet, it helps the individual with many health related issues as well that can manifest in its period like indigestion, insomnia, skin disorders, hysteria, poisoning of any kind and especially undiagnosed diseases – those for which no specific reason can be ascertained easily. A good tool is important for executing a task and achieving the desired result. Likewise, it is extremely important to ensure that the gems chosen are of jyotish quality so that you can get the results you are seeking with regard to your objectives for implementing gem therapy.